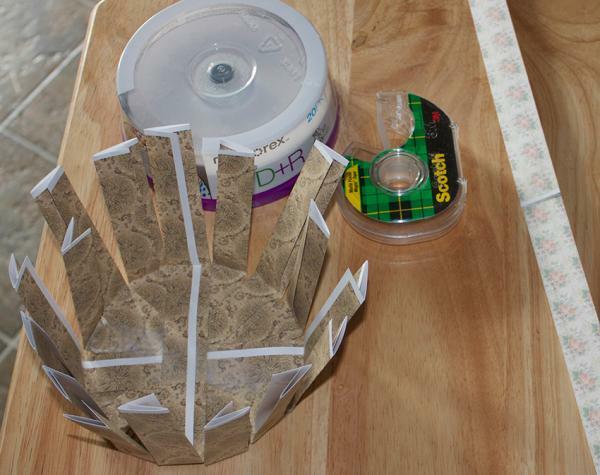 Learning how to weave a paper basket is not difficult. Once you master the basic technique, you'll find yourself making baskets for every possible occasion. 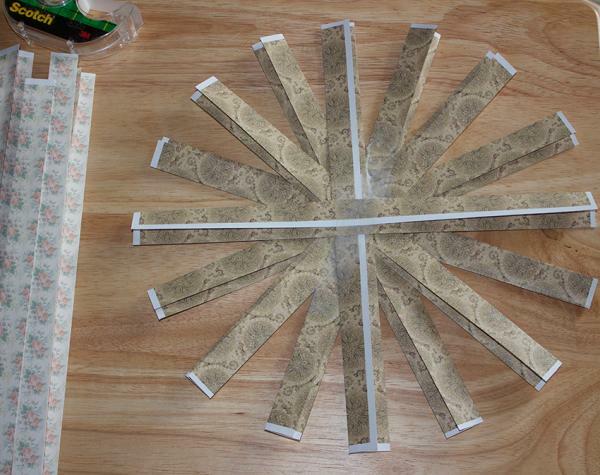 Fold each strip in thirds, lengthwise. Use the blunt side of a butter knife to run across the folds in order to get the creases tight. 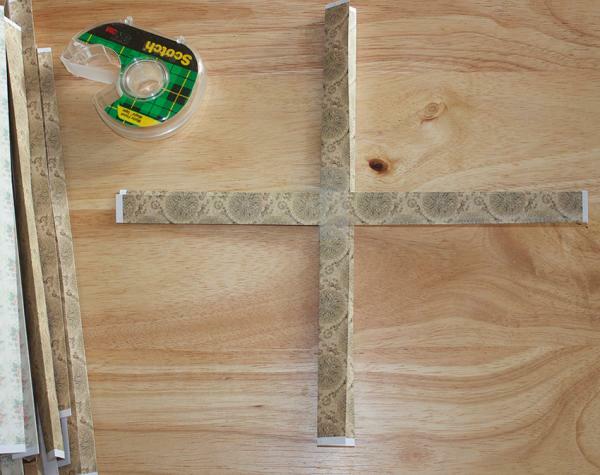 Create the base by using 8 strips and creating 4 crosses. Arrange the crosses one over the other taping each until you get an asterisk shape. Center the strips on the container you want to use. Bend/fold the strips around the edge of the container. Remove the container and turn the basket right side up. Crease the folds created above. Begin weaving the first strip around the basket. 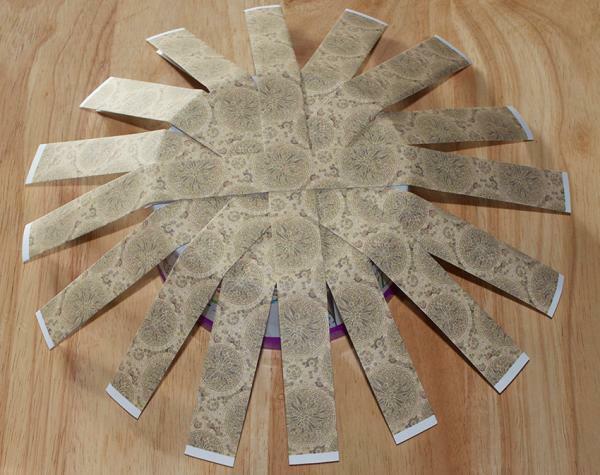 Start by taping or gluing the end to one of the upright strips on the base. Cut any excess strip length off when you get to where you started on this row. 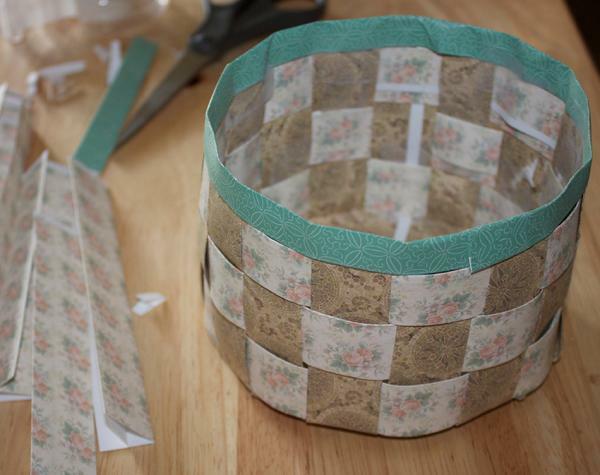 Continue adding strips up the basket side, alternating where you go over and under in a woven pattern, until there is approximately an inch left unwoven at the top. 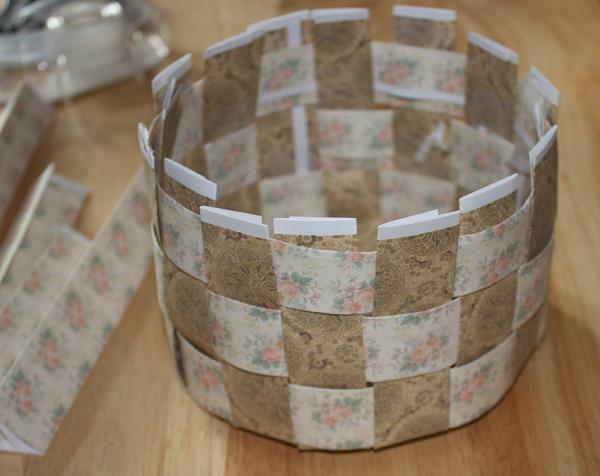 Cut the top edges of the upright strips so that they are fairly even around the basket. 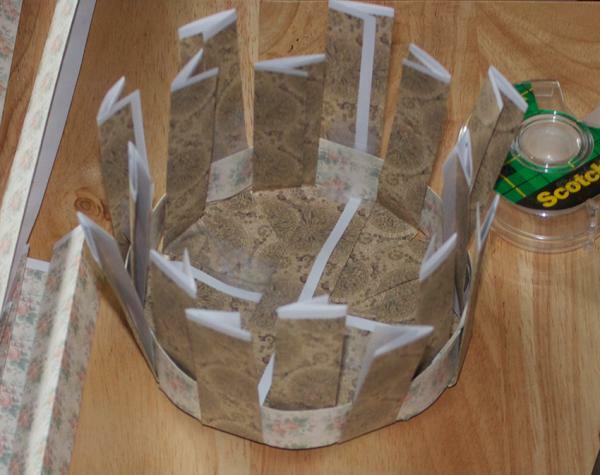 Fold the upright strips down into the basket and tape or glue them. 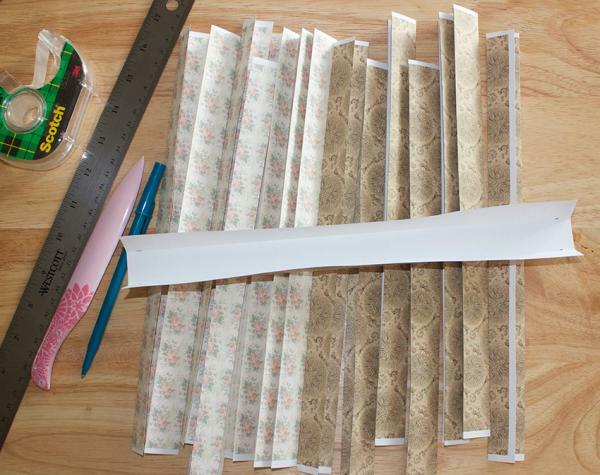 Or, you can use a folded strip of paper to create a top border. To do this, fold two pieces of paper in thirds to create two more strips (or however many you need to get around the top edge and cover the upright strips with it taping or gluing it on the inside to hold it in place as you go. Use another folded piece of paper to add a handle of any length you like. Tie a ribbon bow around the front of the basket. Add glitter to selected areas of the basket for a fun sparkling effect. 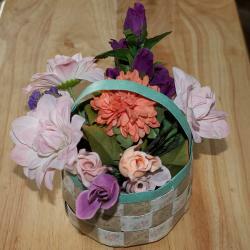 Decorate your basket with paper flowers. Cut a favorite photo into a tag shape, then tie it to your basket handle. If you're making your paper basket with a child, let him decorate it with stickers and crayons. Fill a basket with silk flowers to make a fun centerpiece for your next party. Look for ways to incorporate colorful baskets into your holiday décor, such as filling a basket with plastic Easter eggs or leftover Christmas tree ornaments. Fill baskets with candy to take special homemade treats to friends and family. 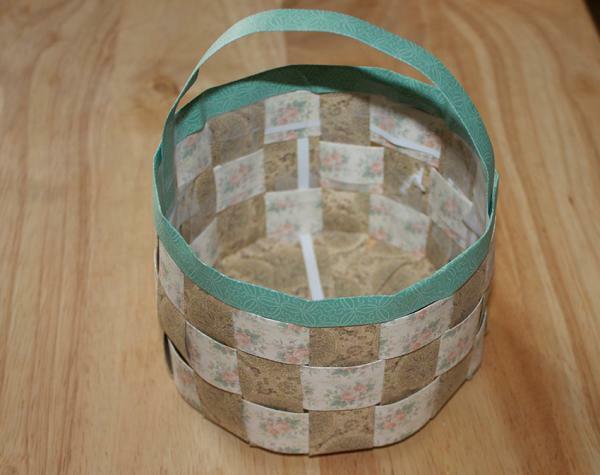 Make a basket instead of purchasing a gift bag the next time you need to give someone a present. After a child's birthday party, use small baskets to present the contents of the "goodie bag" to each guest. Use baskets to store small items in your office, such as pencils, paper clips, and rubber bands.